Danna Golden is the owner of Saddle Up. While Danna grew up riding horses, she developed a passion for the world of business. Danna’s father started Saddle Up as a retirement hobby with 17 saddles in his basement, and as Saddle Up grew he asked Danna for pointers. Danna quickly recognized the value of her father’s hobby. They teamed up and Danna began transforming Saddle Up into a full-service tack shop. Today Saddle Up has over 250 new and used saddle and a great variety of western tack. 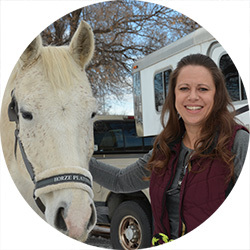 Danna takes pride in the relationships she has built within the horse community both locally and nationally. Darcie is a Colorado native and has loved horses ever since she can remember. She was blessed to receive her first horse as a gift when she was a teenager and since then she has been on a journey to discover and learn all she can about these amazing creatures. She has trained in different disciplines and horsemanship techniques and is always expanding her knowledge and skill set. 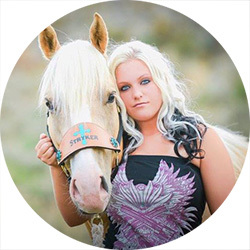 Her passion is learning how to be better partners with her personal horses as well as encouraging and helping others have a better relationship with theirs. 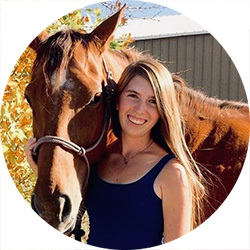 She graduated from Prairie Winds: Art of Equine Massage and Bodywork in the summer of 2018 and is a certified equine massage and bodywork therapist as well as a riding instructor and horse coach. She has been working at Saddle Up since November 2013 and continues to be incredibly grateful for all the experience, knowledge, and opportunities it has provided! Lynnsy was born and raised in Colorado. Horses have been in her family for generations, and she immediately fell in love. Lynnsy’s family raised Quarter Horses, Paints, and Appaloosas when she was young. The whole family also competed in rodeo. Lynnsy took a liking to barrel racing and began competing at a very young age. She was on a horse before she could walk, and her parents would lead her around the barrel pattern at local gymkhanas. She now competes at local barrel races and has goals to become a professional barrel racer. She has qualified for big events such as the NBHA World Finals and she hopes her young horse, Stryker, can make all her dreams come true. Lynnsy started coming to Saddle Up as a faithful customer and soon became friends with the owner, Danna. She loves working here and is very passionate about helping the shop grow to its full potential. She is also grateful for such an amazing group of people to work with and now call family. Bill’s innate interest in horses was influenced by both sides of his family tree. One of Bill’s grand fathers owned race horses, while his other grand father owned a ranch. In his youth, Bill competed in 4-H, junior rodeos, high school rodeos, college rodeos, and the Professional Rodeo Cowboys Association. Horses shaped Bill’s life, but leather working peaked his interest at the young age of seven. 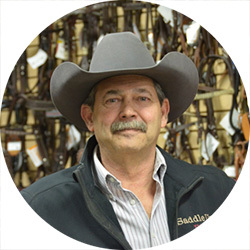 Bill built his first saddle in 1974, and now he is constantly creating and repairing leather commodities for our customers. Although leather work is time consuming, Bill still finds time to compete in team roping events with his mare Jaquar. Ryleigh’s love for horses began early in life as she rode Morgans at her grandparent’s home in Parshall, CO. After many years of begging, her dad finally caved and purchased her first horse, an off-the-track Thoroughbred. Seven years ago, she made a leap and tried something new and joined 4-H to start becoming competitive. 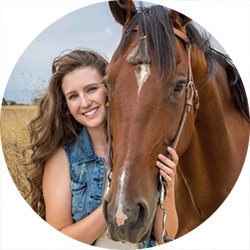 Ryleigh has experienced a total of eight horses in the years since she started 4-H. Every horses' skill level and personality varied, therefore Ryleigh values the challenges she faced in order to transform her into the rider she is today. After years of searching for the perfect horse, Ryleigh fell in love with a big, bay gelding named Lenny. Ryleigh and Lenny participate largely in reining and hope to begin cattle work and mounted shooting in the future. Ryleigh is currently a full-time student at Aims Community College studying Production Agriculture, with a concentration in precision agriculture technologies and animal science.